When you search for a wearable fitness tracker, your search results are likely to pull up thousands of options from chest straps to wristbands. How do you know what you want or where do you begin? While one fitness tracker may have some of the primary features you want in a fitness tracker, it may fall short and miss a few key components. The ideal fitness tracker should be comfortable, accurate, and eliminate your need for carrying multiple devices when working out. Wrist fitness trackers with heart rate monitors are usually more comfortable than chest straps, and when you select the right one, it’s lightweight, accurate, and meets all of your fitness tracking needs. Polar A360 is a wearable wrist device that acts as a heart rate monitor, an activity tracker, a smartwatch, and a fitness tracker. Since this device has the ability to monitor your heart rate and your activity 24/7, it’s a great device to wear from sunrise to sundown and straight on through the night. The 1.06 x 0.51” inch color TFT LCD display is small enough to go unnoticed but easy enough to read whether you’re outside in the sun or waking up in the middle of the night. Although this fitness tracker/smartwatch has some of the same features as similar devices, the design is sleeker and streamlined making it less bulky or “in the way” when sitting at your desk or working out at the gym. Like other wearable fitness tracking devices that are comfortable enough to wear 24/7, the Polar A360 tracker can calculate how many calories are burned throughout the day, track your activity (including your sleep patterns), and monitor the heart rate. Polar A360 is a unique wearable device because, in addition to having all the “must have” features of a fitness tracker with smartwatch capabilities, it’s a waterproof device. Many similar trackers are water resistant but shouldn’t be worn when swimming or participating in other water sports. Due to its waterproof design, users of the Polar A360 fitness tracker can train for triathlons or add swimming to their daily activities without having to take the device off. This tracker is waterproof-rated for about 30 meters (or approximately 100 feet) of water. With constant tracking and monitoring, you can get a better understanding of your sleep patterns and how to improve your sleep. You can also start setting new fitness goals for yourself without worrying if you’re pushing yourself too hard or too fast. All the information you need to make a safe decision about your next workout is all on the device. Don’t have a lot of experience working out? You can get guidance along the way. When you connect with a Bluetooth connection, you can sync the Polar A360 tracker to most iOS and Android apps. While it will deliver notifications about texts and posts on social media, you can’t answer phone calls or control your music from the device.The tracker will sync with devices compatible with iOS 8.0 or later and Android 4.3 or later. If you are looking for a fitness tracker and smartwatch that has GPS, consider shopping for a watch specifically for runners. This wearable wrist tracker is not only more comfortable than a chest fitness tracker, but it’s also more accurate (and has better accuracy than comparable wrist trackers) when it comes to monitoring the heart rate. Knowing what your actual heart rate is at any time can help you exercise more safely. Busy and stressful days at work can keep you from getting up and moving around when you need it the most. Polar A360 send vibrating smart notifications and inactivity alerts to remind to you take a break and move around for a bit. Although fitness trackers can be motivating enough as is, you can also receive positive words at the end of a day; every little bit can help when trying to be a healthier you. The Polar Flow app, which you sync with the device, shows you all of the details of your day from heart rate to whether or not you were sitting or lying down. Every detail can help you achieve new goals and change bad habits. Although the wristband is comfortable, if not fastened properly it would be easy to lose the device. Since the device is lightweight and barely noticeable once you get used to it, you may not notice it’s gone for miles into a run. Getting the right size wristband may help to reduce this issue. When you want to sync the results from the device to your smartphone, you need to press a side button to sync it with the Polar Flow app. While this may not be too big of a deal, it may take some getting used to and remembering that the syncing is not automatic. Battery life of the device, between charges, may vary greatly from user to user and is dependent on how frequent users wear and use the device. Every new fitness tracking device takes a little time to get used to and learn all the ins and out. After you have set up your device, you can turn on the display with a simple shake of the wrist or press the button on the side. Browsing and using the menu is relatively straightforward by swiping and tapping the screen. To return to a previous item, press the button on the side. The heart rate monitor on the A360 is accurate, but for it to work as flawlessly as possible, the user needs to wear it correctly. The wristband should fit snug on top of your wrist and position the band just behind your wrist bone. The heart rate sensor, which is located on the back of tracker, needs to be in constant contact with your skin. Wearing your wristband too tight can interrupt blood flow and be uncomfortable while too loose can result in inaccurate heart rate readings. If your skin gets cold easily, warm up your skin before wearing the device and if you have tattoos on your wrist, avoid placing the sensor directly on the tattooed skin as it can interfere with accurate readings. The device’s memory is good for up to 60 hours of training with heart rate monitoring, but it may vary depending on which of the 15 language settings you select. The 100 mAh Li-pol rechargeable battery has “life” for up to 12 days of 24/7 activity tracking and 1 hour per day training (without Smart Notifications on). Like all fitness tracking devices, the battery may need to be charged more frequently depending on how often you work out and other factors. Charging your A360 can take up to about two hours, but if you charge it with the regular USB adapter, rather than the computer USB port, you may get a faster charge. The A360 is a suitable fitness tracker for anyone who is just starting to work out or who is buying a wearable tracker for the first time. It’s also packed with enough features that even people, who exercise every day, can benefit from the all the devices offerings. After you sync up your device with your smartphone or another device, A360 will begin tracking every step you take, how many miles you walk, your heart rate, and the number of calories burned. If your device senses that you’ve been sedentary for too long (it can differentiate between sitting or lying down), you will get a notification that gently reminds and urges you to get up and move around. While this is merely a suggestion, it can be just enough prompting to keep you on track and motivated. Other fitness trackers will track and monitor the same kind of movement that the A360 does but with this device, you can create individual (up to 20) Sport Profiles for each type of exercise; it’s kind of like creating a filing system for your various workouts by keep it organized and easy to read. Utilizing the training sessions on your A360 is a great way to set goals, met your target, and stay motivated. To use a training session, you go to “My Day,” select your target (goal) from a list and choose the appropriate sport. You can activate your training session by shaking your wrist, and the display will turn off to conserve your battery. After you complete your training session, you receive a summary right on your A360 device. You can also visit the Flow app or the Flow website for a more detailed and illustrated analysis of your session. In your summary, you will see your start time and the duration of your session. You can view your average heart rate, your maximum heart rate, and other heart rate zones. In addition to seeing how many calories you burned in your training session, you can also view the average and maximum speed, as well as distance (in certain sports profiles like running or walking). Comfortable and Lightweight: Since the design of the A360 is more streamlined than other fitness trackers with the same capabilities, users may be more inclined to wear the device 24/7. The silicone band is lightweight, flexible, and available in three sizes: Small (130-170 mm), Medium (155-200 mm), and Large (180-225 mm). Selecting the right size band can help keep tracking more accurate. Compatibility: This Polar device is compatible with a variety of operating systems. For mobile compatibility, you need an iPhone 4S or later or an Android 4.3 or later. If you want Smart Notifications, you need to have at least an Android 5.0. When syncing to your computer, the device is compatible with Windows XP through 10 and Mac OS X 10.6 through 10.12. Simple Cleaning and Care: Although the device is waterproof, it’s best to keep your tracker and wristband clean and dry after every training session (particularly after sweating or using a chlorine pool). Avoid storing your tracker in a damp place like a wet gym bag and make sure it’s clean and dry before charging. 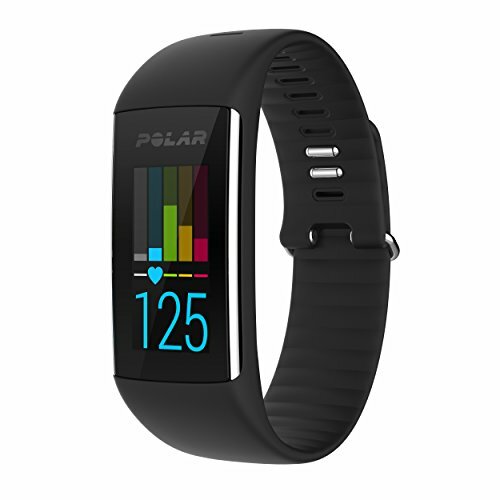 Accessories Included: Since the Polar device is simple and needs no “extras,” it comes with the tracker, the wristband you select (other bands are sold separately), and a charging cable. For Optimal Performance: This Polar wearable device is durable but to ensure optimal performance while wearing, avoid wearing lotions or perfume on the area of skin where your tracker comes in contact. The device operates at temperatures between 14 °F and 122 °F. Choosing a fitness tracking device can be an overwhelming process if you’re doing all the research yourself. That’s why we have done all the necessary research, shared the highlights, worn the device, and talked with other fitness enthusiasts who love this tracking device. Here’s what some of the fans of the A360 have to say. Users of the A360 fitness tracker found it hard to select just one thing to like about the device. They love the ease of use, the versatility of the device, the 24/7 monitoring, and the comfort. One of the biggest compliments of the device is that it’s waterproof (as many similar devices can’t be worn when showering or swimming). Although the Polar A360 reviews on Amazon were mostly positive, some users complained about connectivity and syncing issues. Another common complaint was how the band fit (some struggled to keep it on, and others lost it while working out). Both of these issues might be easily resolved if you make sure that you have compatible mobile or computer devices as well as updated software and apps. As for an ill-fitting band, the best solution is to select the right size band to fit your wrist snug but comfortably. While the A360 has many of the same features as similar fitness trackers on the market, the design and waterproof features make it an ideal device for anyone (regardless of activity level or fitness experience). 24/7 monitoring can help users become more in tune with their health, set fitness goals, and achieve them through practical training sessions. The device is designed to help users be accountable for their daily choices but offers enough prompting for motivation.